Thank you to all our veterans, past and present, for all you have done and sacrificed for our freedoms! Saturday was the big Perry 200 parade in Erie. 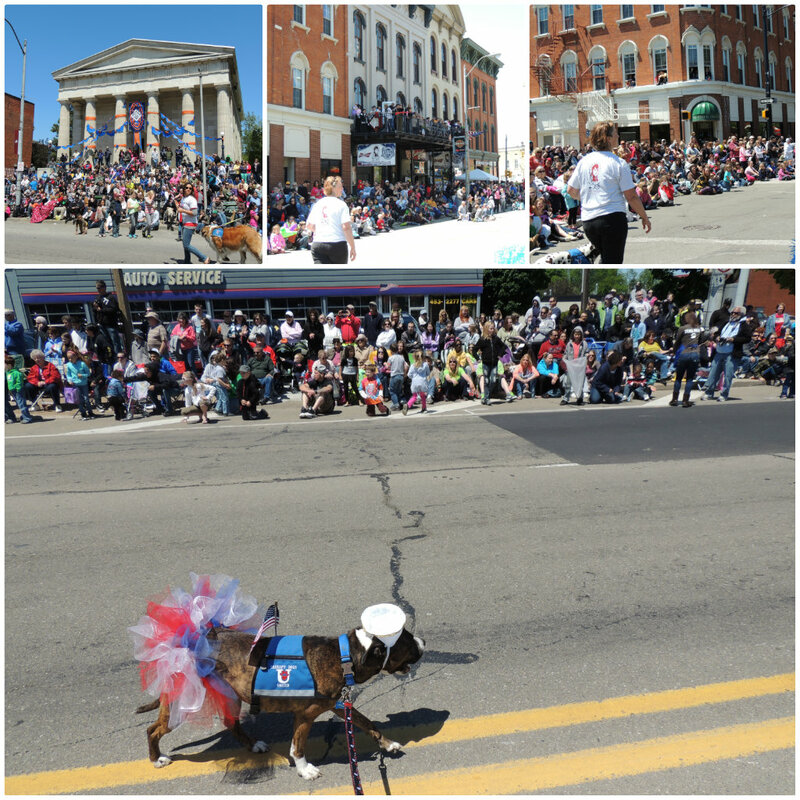 It is estimated that 145,000 spectators came out to enjoy the beautiful day along with the 10,000 parade participants! It was a huge event! It seemed everyone in Erie came out to see! 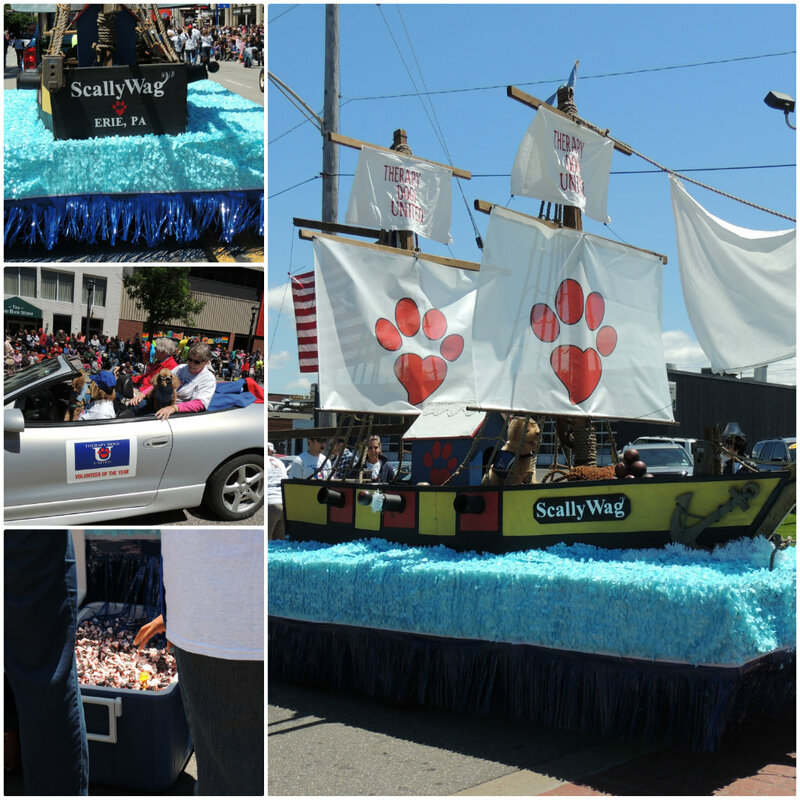 The Therapy Dogs United float The Scally Wag: "Don't Give Up the Yip!" turned out great - we won Best Float! 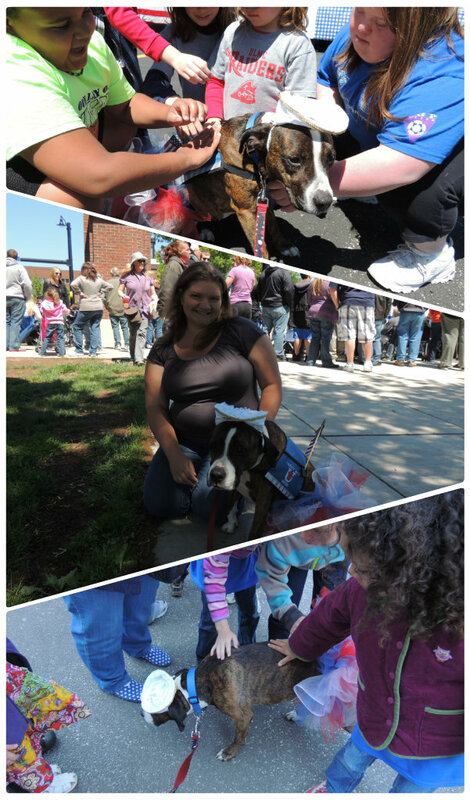 All of the other therapy dogs did awesome! The little frenchie in the top-left is Tess's friend Hannah - isn't she a doll! Tess was a big hit in her festive tutu - everyone loved her! Thanks to our Facebook friends that came to say hi to us!! What did you do over your weekend? The past year has been a big year in Erie - it is the 200th anniversary of the Battle of Lake Erie during the War of 1812. 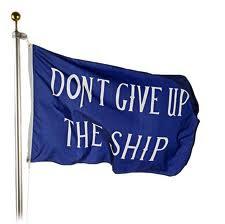 The Perry Commemoration "recognizes...Oliver Hazard Perry's naval victory..." in this battle. This Saturday at 1pm is the Grand Patriotic Parade! 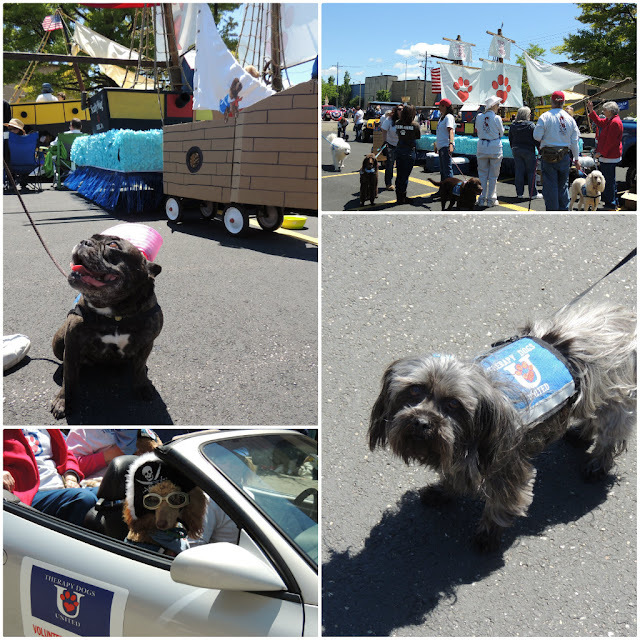 Therapy Dogs United has a float in the parade...which from what I hear is going to be pretty fantastic!! So if you're in the Erie area, make it a point to come celebrate with us and the anticipated crowd of nearly 100,000! Look for us...we'll give you a clue. If not, tune in Monday for details!! Last month, we realized that we had been seriously slacking on our structured walks. So we began a 60 day walking challenge to get us back on track. 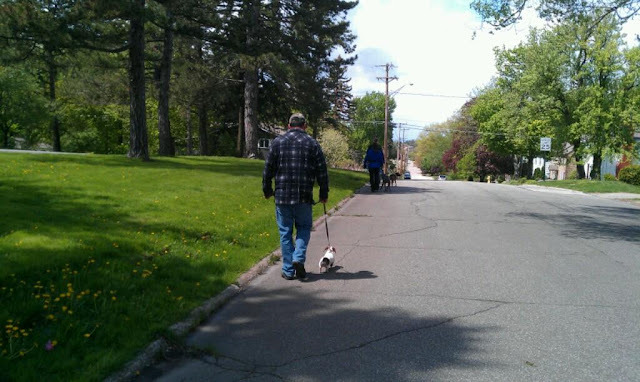 Each morning (sometimes late morning on weekends), we leash up the pooches and take them for a walk. Unfortuntely, we don't have time to go too far. 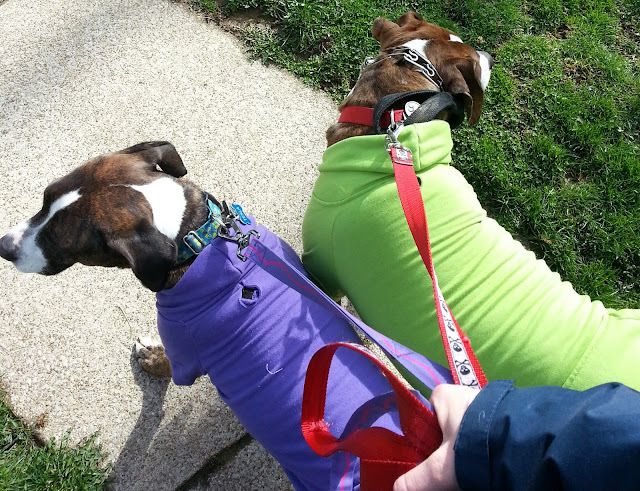 However, our 20 minute walks have not only provided structure and routine to the dogs, but to the humans, too. 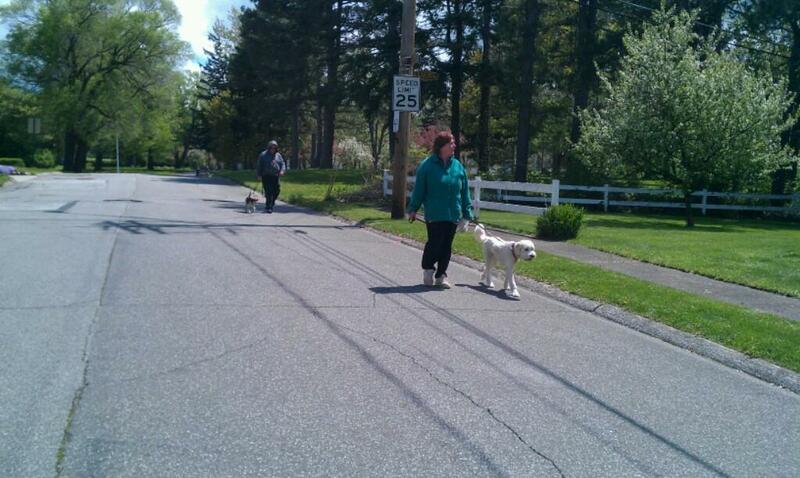 In the past 30 days (well, technically 29), we have only missed 2 times (and twice just walked with Tess). We've definitely seen an improvement in Tesla's walking and our walks have uncovered some new issues with Ed that we now know we need to work on. So if you see a crazy lady riding a bicycle up and down the same block, you'll know why. Have you gotten back into a routine now that the weather is turning? Have you noticed any changes in your pooches? With summer fast approaching, we'll be doing more traveling and so will our pooches. This past weekend, we took a short overnight road trip which allowed us to take a look at our canine travel gear. We keep our travel bag partially packed with a few essentials. Adding a few things, we're ready to go! We have three crates in the house. We take the smaller two with us. And while they are an absolute necessity, they are quite burdensome to lug around. However, with a Subaru Forester, the two crates easily lie in the back. Of course, for any car ride, the pooches wear their seatbelts. 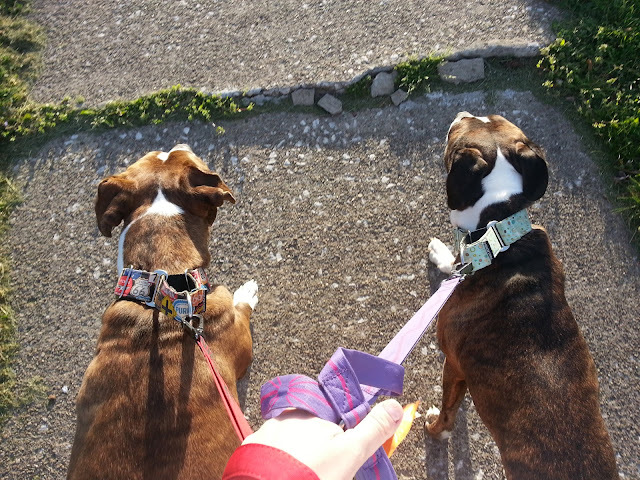 Last summer, we were in a minor accident and were so glad the pooches had their belts on - not only did it keep them from flying forward during impact, it kept them in place during the hoopla afterwards. There are a few things missing from our kit: first aid kit (one in our travel kit and one in the car) and doggles (for trips to the beach, sticking their heads out the window). We also need a better way to haul the kibble. What do you have in your travel kit? Is there anything we are missing? How do you haul your kibble? 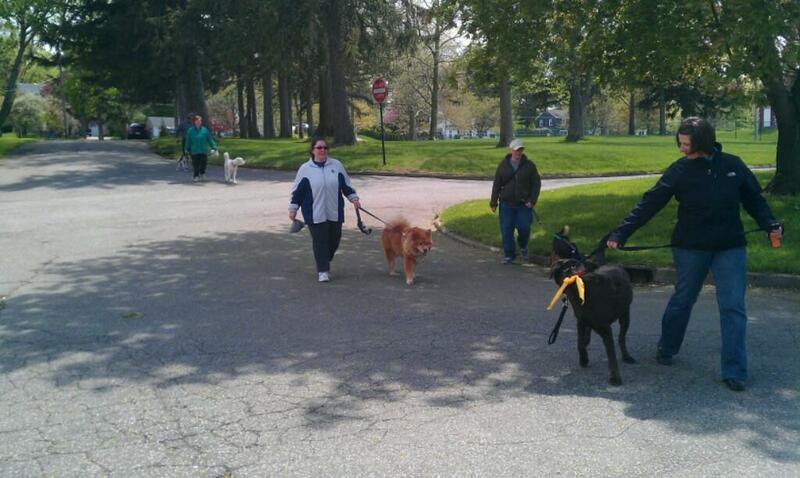 Yesterday was out second walk for Pack of Erie Dogs. Although it was chilly and blustery, we still had a great turn out! Another dog-in-progress joined us, Wynston! And he did awesome. I am so happy he and his owner came out with us yesterday! 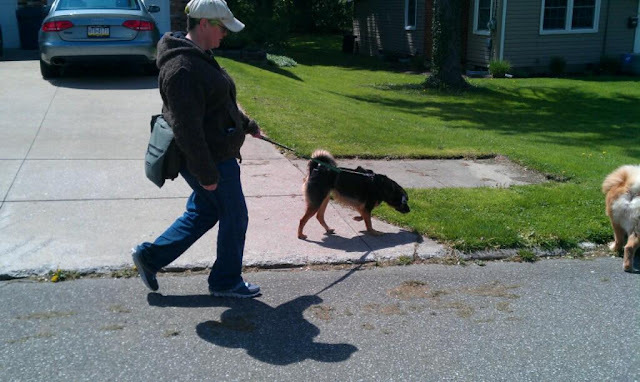 Last week, we passed a yard with a loose dog and his owners. I approached them and let them know that several dogs would be passing and asked if they could secure their dogs. 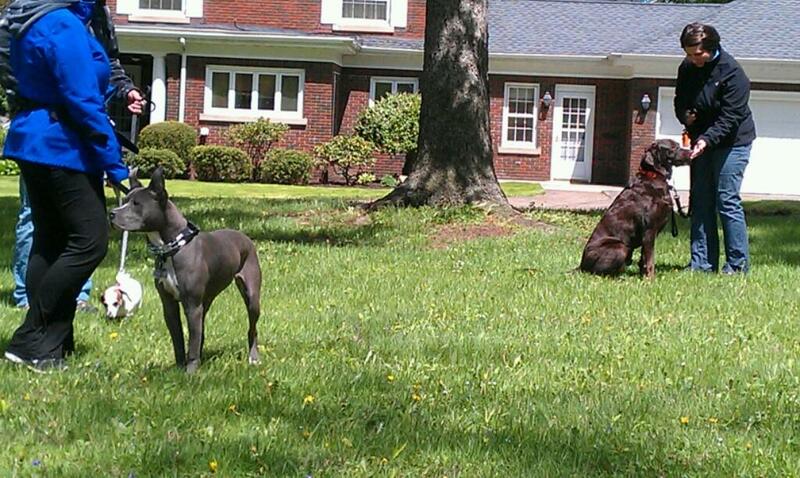 I then went to walk by our reactive dogs to intercept if needed. When we passed, they had not secured their dog in any way. 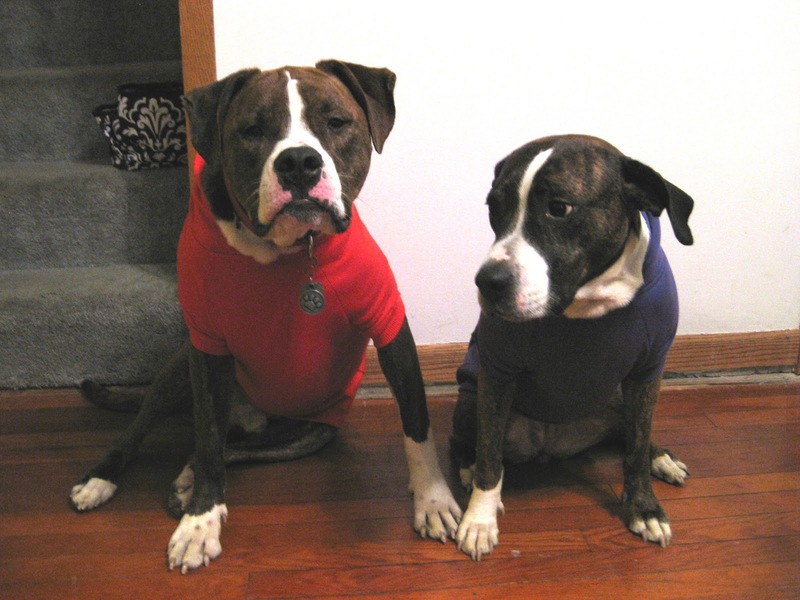 Luckily, our dog owners are awesome and made sure to keep their dogs' attention. 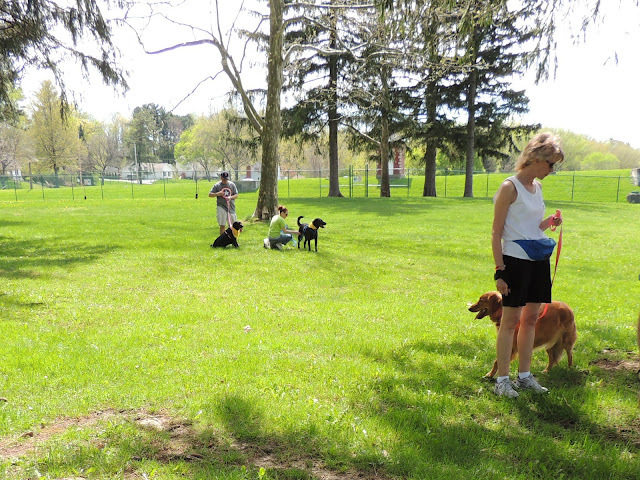 This week, we came across a few other off-leash dogs while we were taking our water break. Needless to say, we cut it short and got back on the road. We're so glad our new folks joined us yesterday and are looking forward to next week! Do you have any tips for dealing with off-leash dogs and their owners? 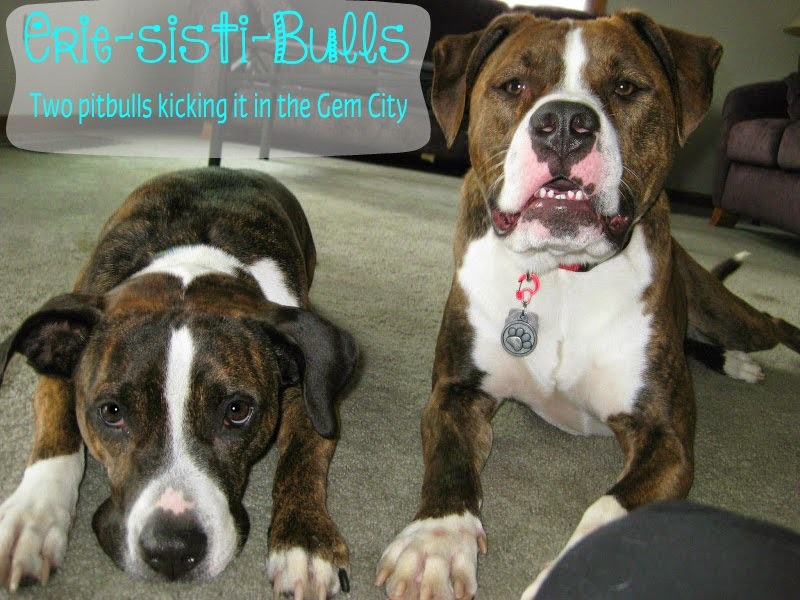 The awesome Morgan of Temporary Home, Permanent Love wrote this post on what her pooches are made of...and we're not talkin' DNA. This got me to thinking...what are my dogs made of? 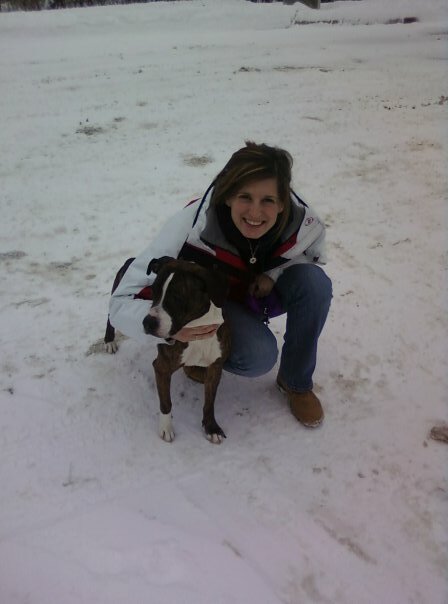 Tesla: 50% anxious, 25% loyal, 15% cuddly, 10% badass -- 100% the reason I love pitbulls. Edison: 40% protective, 30% stubborn, 20% goofball, 10% frustrating -- 100% the reason I started this blog.